Since it was discovered, Terror EK has been re-branded as Blaze EK (or possibly Nebula EK), but I'm calling it by its original name. The compromised website (info I cannot share) generated two URLs leading to Terror EK. The first URL came from obfuscated script in a file named custom.js. It led directly to an outdated Terror EK landing page that no longer works. The second URL led to a gate at uploadrobot.download that redirected to an updated Terror EK landing page that worked. I could not find the script that caused the second URL for the gate, but it was probably obfuscated like in custom.js. 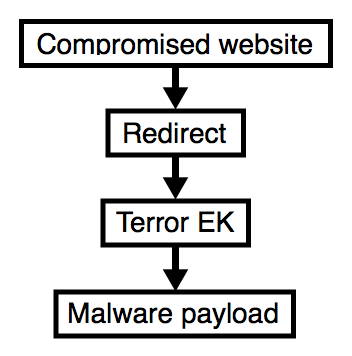 I accidentally filtered out traffic for the outdated Terror EK landing page in the 1st run pcap. The 2nd run has the outdated Terror EK landing page URL, and it also has follow-up malware not seen during the 1st run. Shown above: Flow chart for the infection traffic. Shown above: Some alerts on the 1st run pcap from the Emerging Threats Pro (ETPRO) ruleset using Sguil on Security Onion. Shown above: Entries in the Windows registry making the EK payload persistent after a reboot. C:\Windows\sytem32\Drivers\etc\hosts to resolve the domain to an actual IP address.